Hendrick Motorsports has amassed 242 Sprint Cup victories and 11 driver championships since the team was created in 1984, but it has been in an 18-race winless drought. That could change Sunday. Hendrick Motorsports has amassed 242 Sprint Cup victories and 11 driver championships since the team was created in 1984, but it has been in an 18-race winless drought since winning in March at Fontana. 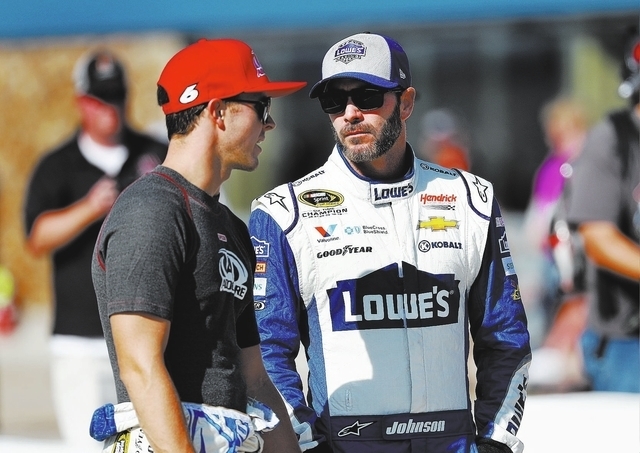 Based on Friday’s qualifying and Saturday’s final practices at Michigan International Speedway, the streak might be coming to an end Sunday, as Jimmie Johnson and Chase Elliott have things figured out with the new reduced downforce package. The new package, which was used on a trial basis in the June 12 Michigan race and last month at Kentucky Speedway, uses a shorter splitter and spoiler with the idea of creating more passing and giving more appeal to fans. The Team Penske Fords had things dialed in the most with wins in those races, but the Hendrick crew looks stronger this weekend. Adjusted odds at the Westgate show just how much respect there is for the Hendrick duo after practices, with Johnson being adjusted from 15-1 to 8-1 and Elliott from 20-1 to 10-1. Johnson will start second and Elliott fifth. Elliott had the third-fastest lap (201.196 mph) in Saturday’s early practice and was second-fastest (197.786) during a shortened happy hour, during which he also had the second-best 10-consecutive lap average. Johnson had the second-best 10-consecutive lap average in the early session and the third-fastest lap (197.694) in happy hour. Johnson’s only Michigan victory was in 2014, which is bizarre because he has six wins at Michigan’s 2-mile sister track at Fontana. 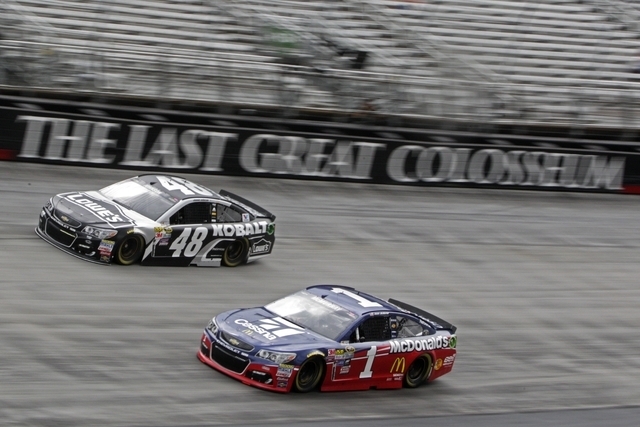 He’s had just about every type of malfunction possible late in races to derail him from winning there during his dominant years — his 637 laps led are the most among active drivers. Elliott had his best career finish at Michigan in June, when he led 35 laps before settling for second. It was his 11th top 10 in 15 races, but he hasn’t had one since, a span of eight races finishing 13th or worse. But based on his strong practices, he should contend for his first victory at a track in which his father, Bill Elliott, won seven times. Nineteen pole sitters have won at Michigan, and it has been even more dominant since the track repave in 2012, as four of the past six winners have started up front. Joey Logano’s two Michigan wins have come from pole, including the June race, when he got out front and stayed there, leading 138 of 200 laps. He didn’t do anything extraordinary in Saturday’s final practices, but he definitely has recent track history on his side. He’s also with the dominant manufacturer at Michigan in the battle for Motor City bragging rights, as Ford has won 35 times (Chevrolet has 23 and Toyota five). Also, Team Penske won both races using the reduced downforce package (Brad Keselowski won at Kentucky). Tony Stewart won his first race at Michigan in 2000 driving a Pontiac for Joe Gibbs, and yet while he leads all active drivers with 21 top 10s there, his second win never materialized. He’s 30-1 to win Sunday in his final Michigan start, and there’s a case to be made for him to cash. He has five top-five finishes in his past eight starts since winning at Sonoma in June. One of those was fifth at Kentucky using the same low downforce package that’s in play this week. In Saturday’s early practice, he had the fastest lap of the day at 202.122 mph. Micah Roberts, a former sports book director, has been been setting NASCAR lines in Las Vegas since 1994. Follow on Twitter @MicahRoberts7.